Keep your business clients happy by offering more services; plus, bring in additional income. Merchant Industry offers a special program for community banks. We will help your institution expand services without any additional investment, bring in revenue and keep your clients satisfied. Our goal is to provide your clients with a state-the-art suite of products and services available for a competitive investment. We deliver through personalized relationship management by professionals who understand your business. 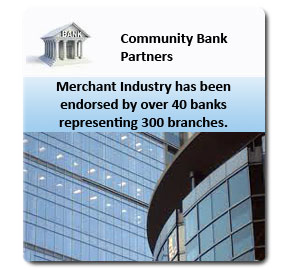 Merchant Industry has been endorsed by over 40 banks representing 300 branches. We are members of the Virginia & Maryland Bankers Associations, ATM Industry Association, and more. Provide merchant services at no cost to your bank – save your clients money guaranteed! Protect and leverage your brand through co-branded materials. Create more loyalty – stop the Nationals from soliciting your customers. Increase customer retention through a comprehensive suite of solutions – make your customer “sticky”. Add clients with our special program. Complete support, including marketing, for bank branches and branch managers. Quarterly payments with online reporting access. Flexible equipment payments and training for client. Automatic deposit options within one business day – including American Express. Easy-to-Read Merchant Statements – paper or online. Support for all major credit cards.